Installing blinds or shades in your home may seem like a daunting task. Blinds.com is here to make it easy with our Installation Guide! Keep in mind that the steps in this guide provide a general overview of installing blinds. Depending on your specific product, your installation instructions may vary. Always refer to your specific product for precise installation instructions. Not a DIY person? No need to worry - Blinds.com has professionals waiting to help you with measuring and installation. Click here or call us at 800-689-4496 to find a local professional. 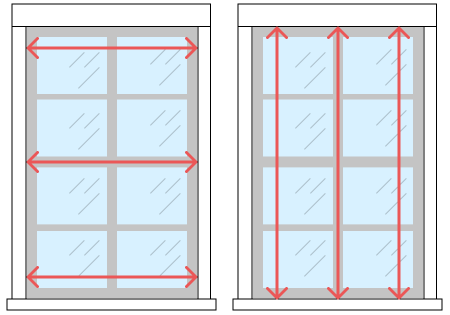 Your window measurements should have accounted for either an inside mount or an outside mount. An inside mount is installed inside the window recess and provides a clean, finished look. An outside mount rests above the window and covers the entire frame. Double check all packaging and make sure you received the correct number of screws, mounts, and hardware with your order before you begin installing. What do you need help installing? The installation process for inside mount blinds may vary slightly depending on your product. These general steps provide an overview for installing inside mount blinds, but always refer to the manufacturer instructions for details specific to your product. Position the first bracket in the upper corner of the window frame so that it's level with the wall's surface. Always check your specific product instructions for the exact placement of the brackets. If your blinds came with a decorative valance, you will need to set the brackets further back into the window opening to allow room for the valance. Mark the screw locations with a pencil. Repeat steps 1 and 2 with the second bracket in the opposite corner of the window frame. If you're mounting into drywall with no studs behind, you will need to use drywall anchors. Use a steel tape measure or a level tool to ensure the two bracket locations are even. Use a drill bit - smaller than your screws - to drill pilot holes through your bracket marks. Install your blinds by sliding the headrail into the brackets, and close the brackets to secure the headrail in place, or snap the headrail into the brackets for other styles. 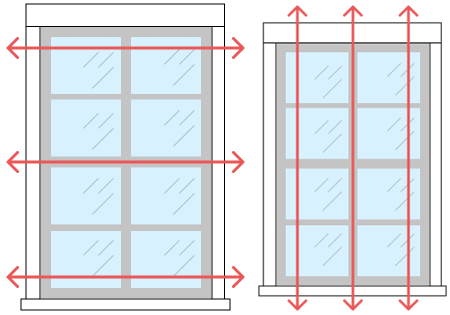 Test your blinds by lowering, raising, and rotating them to ensure all parts are functional. Measure above the window first to make sure you have at least 2" of flat space on the molding or wall. Next, measure the width you want covered. Blinds.com recommends at least 1.5" of overlap on each side of the window for blinds and shades, and 2" of overlap on each side for solar or roller shades. The extra width provides more privacy and light blockage. As always, record your measurements down to the nearest 1/8 inch. Determine the location of the headrail - or top - of the window treatment. This could be installed on the window molding or wall. Mark this spot with a pencil. Measure the height of each window from the mark you just made to where you want the bottom of your window treatment to rest. Consider if you want your window treatment to extend to the sill or lower. If you have a protruding window sill, it is recommended that it be your bottom placement. Be aware of obstructions such as doorknobs or molding. If you have obstructions, spacer blocks or extension brackets are available to help your blind or shade extend far enough to avoid protrusions. Do not take deductions from your measurements. Blinds.com offers an exclusive SureFit™ Guarantee. We make sure you have complete peace of mind when measuring for any product we offer.